Washington, D.C. - October 28, 2012 - The 54th annual Washington International Horse Show (WIHS) concluded competition at Verizon Center in downtown Washington D.C. on Sunday, October 28, with the presentation of championship awards in the pony hunter divisions. Twelve-year-old Daisy Farish, of Versailles, KY, earned the coveted Grand Pony Hunter Championship aboard Bibby Hill’s Sassafras Creek after topping the Medium Pony hunter division. Twelve-year-old Emma Kurtz, of Hudson, OH, was named Best Child Rider on a Pony after winning the Small Pony Hunter division with Bill Schaub’s Hillcrest Blue Halo. Farish and Sassafras Creek won all three classes over fences. Francesca Dildabanian and Laugh Out Loud earned the reserve honors with second and third place ribbons over fences and fourth place under saddle. It was a busy day for Daisy Farish at WIHS. The young rider just turned twelve on October 12 and had multiple ponies to show on Sunday. She arrived at 4 a.m. to prepare with trainers Patricia Griffith and Andre Dignelli of Heritage Farm, and that preparation paid off. Farish won her first championship ever at WIHS. Farish has been showing in the ponies at WIHS for a few years now and felt confident going into the arena this weekend. That confidence was bolstered by great advice from her trainers, and comfort with her ponies. Hillcrest Blue Halo and Emma Kurtz. Kurtz trains with Amanda Lyerly and Mike Rheinheimer, and has ridden ponies for many top owners and trainers this year, including the Gochmans, Mindy Darst, and Bill Schaub. Emma Kurtz received the Best Child Rider on a Pony Award. This was Kurtz’s first time showing at WIHS, and she enjoyed the experience. She will continue showing ponies next year and hopes to move up to compete in the juniors as well. All of the champions also received a special award presented by Ponybeds. Deslauriers is good friends with last year’s winner, Ali Tritschler, and was presented the award by her friend. She has been leasing Center Field since just after WIHS last year and explained that this is her last show on him. She is done with the ponies now and will start riding horses. Deslauriers and Center Field also won the EquiSport Insurance/U.S. Pony Medal Finals this year. Speaking about her jumping round today, Deslauriers explained the advice that came from trainer Krista Freundlich. presented their trophy by Dr. Betsee Parker. Vega has had help from several trainers, including her mom, Amy Vega, Chad Keenum, Kelly Wilson, and Elizabeth Mandarino. Vega has only ridden Edwin a handful of times, including the Capital Challenge Horse Show and local shows at Prince George’s Equestrian Center. The pair has partnered up nicely. Urban and Chelsea Director with WIHS Youth Ambassador Hanna Powers. Urban and Chelsea Director, of Potomac, MD, won today’s final class with a high score of 83. Be Eme Diablo and Alexis Ancel scored an 81 for second place, and Mary Elizabeth Cordia finished in third with a score of 77 aboard Welcome. Cordia trains with Jenny Graham at Cedar Creek in Virginia. She bought her horse Welcome this March and has spent the year getting to know him. Cordia showed at WIHS last year in the WIHS Children’s Hunter Championships and was excited to come back this year. “It is just so cool being in the city because you are down here in the arena and it is the horse show world, but then you walk up and you are walking your horse down the streets in the city. It is just so unreal,” she remarked. The Regional Hunter and Pony Equitation champions were awarded a pair of custom chaps provided by Journeymen Saddlers, Ltd.
For full results and more information, please visit www.wihs.org. 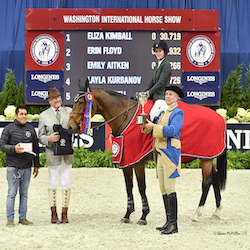 An equestrian tradition since 1958, the Washington International Horse Show is the country’s leading metropolitan indoor horse show and the pinnacle of the equestrian year with top riders, including Olympic medalists and their world-class horses. More than 500 horses participate in show jumping, hunter and equitation events during the six-day show, with many competing all year just to qualify. Highlights include the $100,000 President’s Cup Grand Prix (a World Cup qualifier), the Puissance (high jump) and WIHS Equitation Finals featuring the country’s top junior riders. Exciting equestrian exhibitions, boutique shopping and community activities, such as Kids' Day and Breakfast with the Mounted Police, round out this family-friendly event.